In this video, we’ll talk about blue light and how it affects your eyes. Sunlight is made up of many different colors of light, one of which is blue – the topic of this video. Recent studies on the effect of blue light on your eyes and overall vision have shown that blue light is one of the most difficult colors on which to focus. This is important because we spend hours working on the computer and using our smartphones which give off lots of blue light, during the day and also at night. This can lead to tired and strained eyes or even headaches. Blue light can also interrupt proper sleep patterns and you may not even know it. Sunlight puts our brain into daytime mode while the lack of blue light at night puts our brain into night mode, or sleep mode. Thus, if you do lots of computer work late at night, this leads to decreased serotonin levels, preventing you from getting adequate sleep and then feeling tired the next day. What can we do about the effects of blue light when using devices like our iPhones or laptops in the evening? A state of the art solution recently arrived in our office is a lens made by Bluetech. These lenses which fit nicely into any eyeglass frame and actually blocks out blue light. You can have these lenses configured for most types of eye conditions. For example, the pair of eyeglasses used in this video are progressive bifocals using this blue light blocking technology. You can also use them while playing video games, which helps to avoid blue light from the TV messing up your sleep patterns. We’re excited to be able to bring you this latest eye technology designed to help your eyesight and help to decrease the chance of any problems you may have with your eyes. 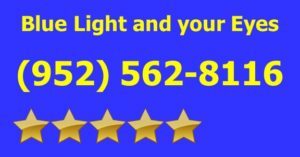 If you’re in the Burnsville, Apple Valley, Prior Lake or Savage MN area, stop by our 5 star rated eye clinic for the best eye exam from one of the most experienced eye doctors in the state of Minnesota. This Burnsville eye care center has constantly received 5 star ratings from your neighbors. When you call us at (952) 562-8116 to make an appointment, you’ll be treated professionally and guaranteed to have the most comprehensive eye exam in town! Stop by or call today to discuss your eye care needs or to learn more about the effects of blue light on your eyes.